This preparation step is simpler, but harder to do than all others. You most probably did the other ones. Cleaned your bag, gathered 25 complete quests, planned to place your HS to SW/Org, filled the mailbox of your alt with whatever material you want to use making money in Cataclysm. Cloth for bags, inks for herbs, lowbie armor, weapon, enchant scrolls for the new worgens/goblins, WotLK mats for tradeskill leveling players since the farmers won't farm these anymore. Maybe you planned to farm new herbs/ores/skins after start, leveling with grinding, selling your materials for 4-5x more than they will cost a month from start. However they all worth nil if you don't prepare in mind to not be carried away. It's easy to get lost in new content. It's easy to be overly competitive, trying to "beat" X, Y or Z in leveling. It's easy to say "yes" to some buddies who want one more guy to a new instance. Sticking to your plan is harder. Loging off "just 3 XP boxes away from 82" to your bank alt to list your wares seems really hard. But it's what separate the rich goblin from another daily-quest grinding random. Two years ago I wrote how I placed my HS back to Shatt when everyone else were questing in Borean/Fjord to make crafting glyphs easier. In the first days of WotLK I was almost the sole provider of glyphs for death knights who were rolled in huge numbers. In the first two weeks of WotLK I doubled my gold, simply by selling glyphs when no other scribe bothered. If you have lot of time, you will still reach 85 fast despite trading. If you don't, I suggest to focus on selling and you can level up 2-3 weeks from now when the zerg will idle in SW/Org spamming "LF2M tank & hilz 4 random hc farming". PS: another business trick: 4.0.3a removes Dalaran portals, but leaving the pilgrim event on. So if you are a mage, you can just go to one of the quest locations and sell portals. Selling portals directly from Dalaran does seem like a good business to me too. There are people who don't bother to read the patch notes (even about their own class), so when they realize that they're stuck in Dalaran, 25g for a portal to Orgrimmar won't seem as much to them since it saves plenty of time. Important thing to be noticed - with 4.03a they have seem to remove ability to exchange Ink of the Sea for any other kind of ink. You now need new kind of ink that's available from milling Cata herbs. I guess Glyph prices just skyrocked on everysingle server. Meaning that we have basicaly 2 "golden age's". 1 is this week and the 2nd one as stated in 2 first weeks of Cata. At my realm I´ve encountered afk-smelting saronite Ore. I got myself 20 stacks for below 10g and further 10 below 12g50. I don´t know what stupid person (more that four until now) keeps feeding me (I buy that value up every day) but you usually shouldn´t question free gold / preCata investment. I´m very into farming ore besides leveling the first day selling it and buying up the cheaper incoming ore at day two or three to level my professions. Also I´ve saved enough material to ensure I´ll be able to relearn my mining into BS when it gets less profitable without buying anything at the AH until hitting the cataclysm spot. Ironically, the removal of portals from Dalaran has invited far too many mages into the market and pushed the price of portals down to a market average of 5g including cost of coming to you, barely a quarter the 20g price prior to patch, not to mention several mages handing out portals for free (i.e. lower than cost price, because they weren't refunded the material cost). "In the first days of WotLK I was almost the sole provider of glyphs for death knights who were rolled in huge numbers. In the first two weeks of WotLK I doubled my gold, simply by selling glyphs when no other scribe bothered." I'm confused by that. Inscription was a new profession at the release of Wrath. Are you saying nobody else sold any glyphs the first two weeks the profession existed? It seems like you are on a very lazy server if that is the case, not exactly the norm. Further, since the profession was added to the game the same time DK's were added, you were not just the sole provider to DKs, you would be the sole provider to everyone. Fishing up Volatile Water isn't the worst passive moneymaking idea, either. Will probably go for 30G a pop as soon as the Cataclysm servers are back up and people want to powerlevel the hell out of their crafting profs. People will be paying mad money to level their cooking early on. A race to Realm First, possibly. I currently have 120 Deepsea Sagefish from cross-zone fishing in Uldum, and I plan to sell them for 200G a stack. Just wish I knew what the hell Murglesnout was for. Does history teach us anything? The most important tip given is to read the old articles. Parrot copying ideas works but is not best I would prefer to decide on the best actions myself. 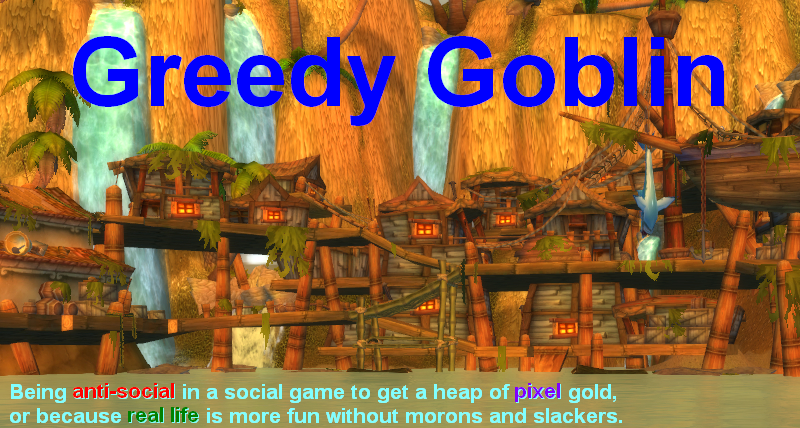 So I say read the old goblins posts there might be a little gold left in them. @Anonymous: inscription was introduced a month before WotLK. Many scribes sold their wares. OK I bite. Please FishyFishFish, explain the trick of fishing into Uldum. volatile ~= crystallized in terms of drop rates and crafting requirements. I would be very surprised if they go for 30g ea. That would be equivalent to eternals going for 300. 3g OTOH, is probably a low estimate, given that in-demand eternals (fire/life) reached 30 at various times well after wrath launch. Probably more like 5-10g early on, and dropping to somewhere in the 1-4g range depending on demand after the early rush is all gone. Mage portal wise, I'm seeing the same thing as squish. Lots of mages advertising portals for 5g or even less, occasionally free (why? just to feel all special I guess). That said, I'm guessing you can make 1/2 decent gold selling portals for 5g ea right now, as you can probably sell 3-5 a minute in key spots (dal horde/alli areas, pilgrim's tables, bank/ah of org/tb/sw/if) making for 1000+g/hr, probably better than dailies. If it was 10g it would be as profitable as your average goblin. Trying to do it before this patch you'd never sell enough to make it worth your while, so there was never any incentive for mages to actively sell portals. On my mage I would only bother to sell portals if I noticed somebody looking for them who was offering 20g+ or 5-10g while being right near me. "place your HS to SW/Org"
So either bug, or it won't work unless you're Human (assuming they had their HS mapped to SW). Looking at the current state of the game, this being yet another bug seems the obvious answer though. "Took some time for me to learn the goblin way. I lost the opportunity to change things in BC, since it's almost up, people no longer raid. In WotLK, I won't waste my time with people who don't want to go further. I will reach the end of the endgame, Arthas will be down." This is just a question, not a challenge. I really want to know if you feel you achieve your goals for this expansion, and if not, what were the causes. Because I didn't, I wanted to kill Arthas in its hardest way (HM in 10 man raid, that's all I could get on my server) and failed. Miserably. I wanted to think it was because in my guild we have to raid with an incredible stupid chaman, and an unfortunately dance of gquits, aplys and dramasthat striked us like hell. But yesterday, when I was saying goodbye to Cairne, I had this awful feeling in my guts that in the end, it was my fault, I wasn't enough goblin. So, what do you feel were your achievements and failures in the game? @Cubone: I killed LK (normal) before 4.0.1, has now a goblinish guild. It's more than I have imagined back then. @ Zurich - I'm finding that I can get 10g + the occasional tip without too much difficulty. It's only worth it if I'm doing something else on another account though, otherwise, it's too much effort to come from a RL action to the computer whenever I get a whisper. What I did do though is macro in a /emote to make my portal casting that much more visible, leading to a number of chain-sales. Blizzard will monitor heroics early in Cata AND... buff healers especially in casting time reductions and mana regen. Blizzard will not "stick to their guns". I would say this will happen-- 4.0.5 will see a mid way buff in healing making heroics puggable. THEN when 4.1 hits and new badge gear is around we will see heroics be facerollable again, just like in Wrath. It's the Blizz way set high early notice that people hate the Occulus Crap _THEN_ nerf what people hate to make them like it. And of course we will get the Ghostcrawler crap blog grandly saying this was all according to plan. Yeah like no healers doing instances for an entire early expansion was a "Plan". Not too complicated. Stand on Tanaris's side of the water with a Water Walking effect, cast away. Make sure you have a sickeningly high fishing skill level, but...it works. I already have pre-orders on my Volatile Waters for 30G each. Judging from the current data mined, Leatherworkers, Tailors and Blacksmiths have an early use for them. And they will be needed in massive amounts. Logically, the fact that I have the 500-525 fish already prepared makes for an easy "Realm First Illustrious Chef" or something. It's easy gold. The Deepsea Sagefish can be cooked into 90INT/STA or 90SPT/STA food. Good sellers, imo. Especially for powerlevelers or early raiders.